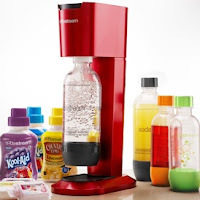 Today only QVC is offering this SodaStream Genesis Soda and Sparkling Beverage Maker Kit for just $90. That's $20 off their lowest price and $70 OFF retail. I got this for my birthday and honestly it's been a life-changer. You can create sodas, sure, but what I use it for is sparkling waters. No more Crystal Geysers or Perriers - I just chill some water in the fridge, froth it up in the SodaStream, then stir in some random mix. I've had problems with not drinking enough water daily, mostly because plain water tastes like plain water, but no longer. Click here to view the offer at QVC.